Cardiovascular Magnetic Resonance provides you with up-to-date clinical applications of cardiovascular MRI for the broad spectrum of cardiovascular diseases, including ischemic, myopathic, valvular, and congenital heart diseases, as well as great vessel and peripheral vascular disease. Editors Warren J. Manning and Dudley J. Pennell and their team of international contributors cover everything from basic MR physics to sequence design, flow quantification and spectroscopy to structural anatomy and pathology. Learn the appropriate role for CMR in a variety of clinical settings with reference to other modalities, practical limitations, and costs. With the latest information on contrast agents, MR angiography, MR spectroscopy, imaging protocols, and more, this book is essential for both the beginner and expert CMR practitioner. 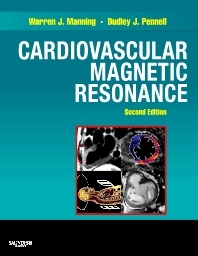 Covers both the technical and clinical aspects of CMR to serve as a comprehensive reference. Demonstrates the full spectrum of the application of cardiac MR from ischemic heart disease to valvular, myopathic, pericardial, aortic, and congenital heart disease. Includes coverage of normal anatomy, orientation, and function to provide you with baseline values. Discusses advanced techniques, such as interventional MR, to include essential information relevant to the specialist. Features appendices with acronyms and CMR terminology used by equipment vendors that serve as an introduction to the field. Uses consistent terminology and abbreviations throughout the text for clarity and easy reference.